Hakusan, Japan, April 3, 2014 – EIZO Corporation (TSE: 6737) today introduced two 24.1-inch monitors to its ColorEdge series of graphics monitors and an industry-first cloud-based solution that reduces maintenance costs and unifies color by centralizing color management of all ColorEdge monitors. The new monitors are the ColorEdge CG247 and the ColorEdge CX241. Both models feature a new wide-gamut IPS (in-plane switching) panel that reproduces 99% of the Adobe RGB color space. The ColorEdge CG247 comes with a built-in calibration sensor for self-calibration and is targeted at professionals in photography, prepress, and post production. The ColorEdge CX241 houses an internal correction sensor that maintains the calibration results after the monitor has been calibrated with an external calibration sensor and is ideal for professionals and prosumers. For color management of ColorEdge monitors1 on a network, EIZO is introducing ColorNavigator Network and ColorNavigator NX. ColorNavigator Network is a secure, cloud-based web hosting solution for administrators to perform quality control (QC) tasks on client ColorEdge monitors with ColorNavigator NX installed. Used together, ColorNavigator Network and ColorNavigator NX allow an administrator to take advantage of the self-calibration capabilities of ColorEdge monitors by performing calibration and other QC tasks on a network of ColorEdge monitors in the same office or even in other cities and countries from a single location. The administrator can automate QC tasks by scheduling them at regular intervals. This can potentially save a post production studio or printing company hundreds or even thousands of hours annually in maintenance downtime while ensuring the color accuracy of its monitors at all times. In addition to adjusting the monitor's color, administrators can input asset management information for each monitor, import/export monitor settings to setup multiple monitors more efficiently, and enable/disable color modes to ensure the correct color modes are used on a project. Also, adjustment information is saved to the monitor so it will display color exactly the same way without the need for recalibrating if it is connected to more than one workstation. For organizations that do not need centralized QC or individual users that require a wide variety of calibration functionality, EIZO bundles its proprietary ColorNavigator 6 software with both monitors. ColorNavigator is used for setting the target values for brightness, gamma, and white point, and generating an ICC profile. ColorNavigator has a scheduling function that activates the self-calibration and self-correction functions of the ColorEdge CG247 and CX241 respectively. The software offers several advanced functions such as emulating the color characteristics of smart phones, tablets, and other devices, and profile validation for verifying calibration results. For video editing and post production, the ColorEdge CG247 has a 3D LUT (look-up table) that adjusts color individually on an RGB cubic table. With ColorNavigator NX and ColorNavigator 6 software’s emulation function, the 3D LUT applies a film look to the image so creators can preview how the image will be seen by their audience. The ColorEdge CG247 comes with several media-standard preset color modes: Rec709, EBU, SMPTE-C, and DCI. Digital Uniformity Equalizer (DUE) technology for brightness and color uniformity. DisplayPort, HDMI, and DVI input terminals. 10-bit display2 (more than one billion colors simultaneously) from a 16-bit look-up table via the DisplayPort input. Five-year manufacturer’s limited warranty including the LCD panel and a 12-month pixel defect warranty3. 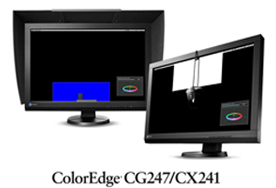 The ColorEdge CG247 and CX241 are now shipping. Date of availability for both monitors and ColorNavigator Network varies so please contact the EIZO subsidiary or distributor in your country for details. ColorNavigator NX will be available as a free download from April 18 on www.eizo.com. EIZO will exhibit the ColorEdge CG247, ColorNavigator Network, and ColorNavigator NX at the NAB Show in Las Vegas, Nevada, USA from April 7 - 10 in booth SL13916. 1ColorEdge monitors supported by ColorNavigator Network and NX are the CG277, CG276, CG275W, CG247, CG246, CG245W, CX271, CX270, CX241, and CX240. 2A graphics board and software which support 10-bit output are also necessary for 10-bit display. 3The usage time is limited to 30,000 hours. RGB full pixel failure is zero for up to 12 months after date of purchase based on ISO9241-307 (pixel failure class I).